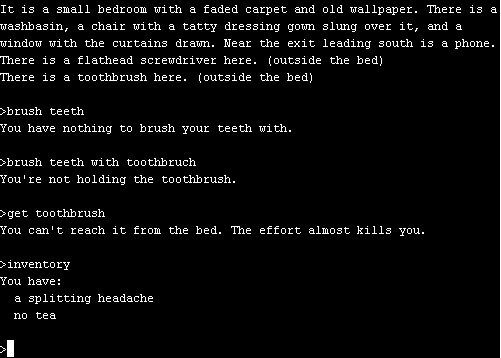 Remember the good old text adventures (and early point-and-click adventures) where you had a set of verbs that you could use to combine various objects? “Use rope on cannon” would make for a makeshift fuse while “use rubber chicken on cable” created an interesting method of transportation. If you remember these, you probably also remember the endless tries of combining things which each other that the game didn’t want you to combine. These games raised false expectations of freedom by pretending to let you do whatever you wanted while actually carefully restricting you to a preset path. Surely there must be more than one use for this incredible rubber chicken? Spinks wrote a strong post on the topic realism in games today, explaining why we don’t really need quests to guide our every step through a role-playing game. One of her examples deals with a wagon on the side of a rode, stuck there because the horse that was supposed to pull it had lost a shoe. Spinks goes on to ask whether we actually need a quest that tells us to find a blacksmith to shoe that horse again. 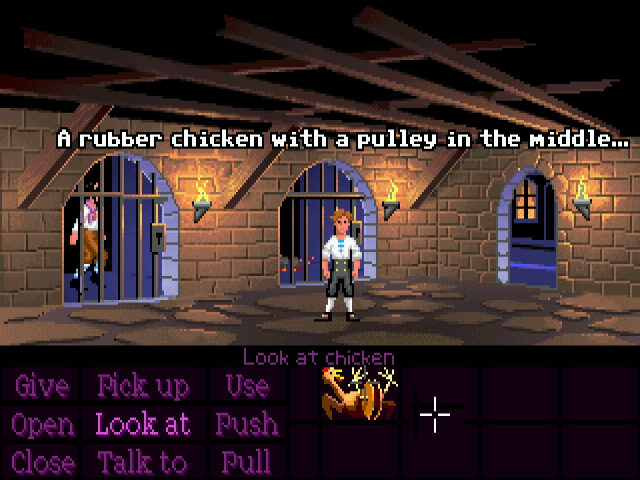 She’s right of course that it would be much more immersive if it was up to us to seek out the nearest blacksmith, or maybe get a fresh horse to pull the cart. The problem inherent in such freedom of action is that it creates false expectations. There are usually various solutions one can think of for a problem and there are endless things to do in an open world. Alas it is pretty much impossible to create a game in which you are actually free to do as you please. Even the most sandbox-y of sandbox games limits possible actions at every turn. When you, as the player, hit those walls and the game tells you “I can’t let you do that, Dave”, immersion is broken. Finding the cart in Spinks’ example, realizing what needs to be done, and then finding a blacksmith to shoe the horse would make for a good gaming experience. Finding the cart, however, and then not being able to let your pet ogre pull it to the next town (because the game has no command for that) is really annoying, especially so when the game previously gave you the expectation of freedom. If, on the other hand, you would simply get a quest from the cart’s driver to go find a blacksmith things wouldn’t be remotely as bad. When the game presents the solution for something for you, there is no need to think about one yourself and then be disappointed when it doesn’t work (even though it logically should). I originally played Hitchhiker's Guide to the Galaxy by Infocom on my Atari ST but never managed to get through it even though I knew the story. I’m not trying to say here that quest-oriented theme park game design is better than open world sandbox design, not at all. Theme parks should almost lead to a slicker, more polished game experience with fewer options for awesomeness but also fewer moments of disappointment due to the shortcomings of the game. If Fallout 3 had been a linear game, I would probably have been a lot less disappointed by the ending. The game designers would have known that I’d have a radiation-immune companion with me when it comes to the question of who to send into the radiated chamber and could have accounted for that accordingly. The way that the game is programmed, however, just lead to me being really annoyed that I could not just send my companion. Part of this goes back to my post about emergence (shallow as it may have been). The more basic the implementation of your world is, the more freedom you can give your players without raising false expectations. Programming a set of solutions for the cart problem above will inevitably lead to disappointment because you can never cover all of them. Programming a physics engine (and an appropriate user interface) and a reward for getting the cart to its destination on the other hand would work much better. Even that can lead to false expectations though. Maybe the physics engine doesn’t understand the functionality of the alcohol-fueled combustion engine you are trying to build or doesn’t give you the option to sell the location of the stranded cart to the next group of bandits. There is no way you can cover all the possibilities that users can come up with, which makes quest-based theme park gameplay the much safer (not necessarily better!) way to go if you want to avoid disappointing your players.